Three levels of resistance built within the bar makes your muscles work harder. Since you're working against 2-directions of resistance, you're exercising multiple muscles simultaneously and fatiguing your muscles quickly. The enhanced muscle recruitment from pulling the force within the bar allows you to workout not just the primary mover muscles, but stabilizer muscles as well. Many people have weak stabilizer muscles and that's how injuries happen. Left untreated that could affect nearby joints, nerves and muscles. Can be folded and measures just 16" long! It fits in your carry-on bag and makes for the perfect travel companion. 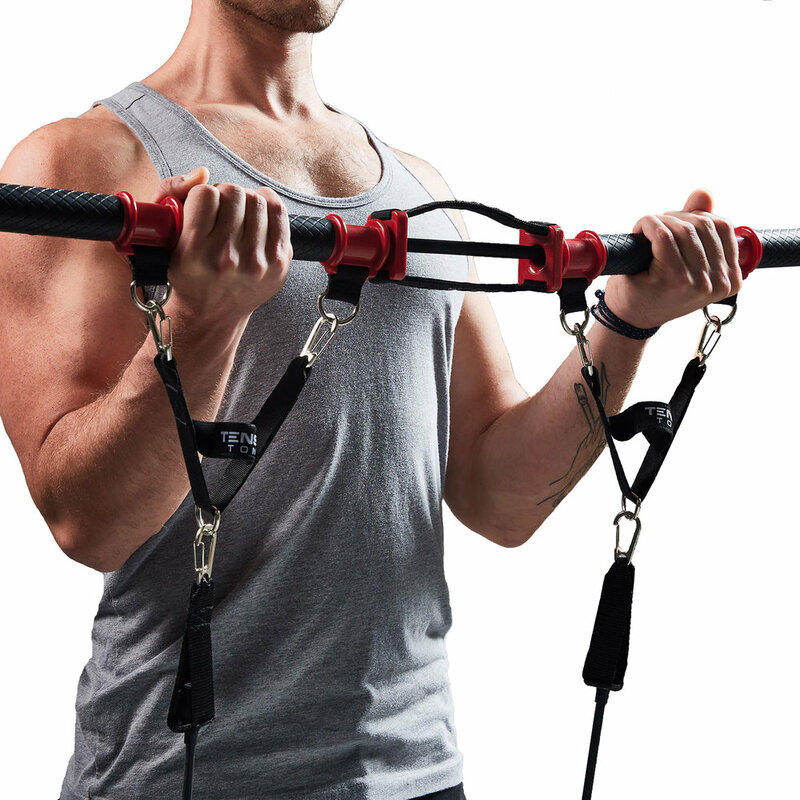 Resistance bands quickly lose tension during the lowering phase of every single rep. Tension Toner keeps the tension on your muscles AND involves more muscle groups to perform the exercise. Complementary membership grants you access to our exercise video library equipped with over 70 exercises . Also includes a nutrition guide. The idea for Tension Toner was inspired by a towel of all things! Joe, the inventor of Tension Toner, had wanted to build off a concept that his grandpa had shown him when he was a kid. Joe’s grandpa demonstrated how by just pulling on a hand towel could use one’s own resistance to build muscle. Fast forward many years later, Joe was exercising at home with some resistance bands and other portable exercise equipment. Even with all this exercise gear, his home workouts just didn't feel as good as when he went to the gym. The rest is history. Now, Joe’s patented invention is helping thousands of trainers and regular people get more workout in less time! • 3 levels of resistance built in the bar itself. • This makes your muscles work harder and challenges your muscles differently! • By keeping the bar separated under tension, your muscles actively pull and lift simultaneously, which means your muscles are under tension during the ENTIRE exercise! We get it... most days you only have short periods of free time, but not enough to block off a full hour at the gym. Imagine how it would feel to get an effective home workout without getting beaten down by dreary weather, traffic, and crowded gyms! Tension Toner takes up little space in your house and doesn't need to be assembled. That means you can workout in the drop of a hat, and literally workout anytime, anywhere. • T10 Workout Program: 10 week program, 10 minutes a day. • The center straps, also known as the "Feedback Straps" gives you instant visual feedback so you know if you are pulling hard enough. 1. You're not controlling the weight well. Try slowing down the rep.
2. The weight you're lifting is too heavy. When the Feedback Straps ARE flat, that means you're engaging multiple muscle groups simultaneously and getting more workout in less time!